A top British intelligence expert had claimed that the US military will have more robot soldiers on the battlefield than real ones by 2025, suggesting that deadly combat robots are rapidly becoming a reality of modern day warfare. US is looking to have a military edge over other countries like China and Russia in the next 10-15 years, and hence comes an invested effort in research and development of robotics systems. While the idea of combat robots carrying heavy armaments in military might make people nervous, robots are being largely resorted as a way to dramatically reduce loss of life and introducing support purposes. Though surge in these combat robots in a way are raising the possibility of a Cold War-style race to build offensive and defensive bot technology, these may revolutionize the way battles are fought in the future. US has been using unmanned aerial vehicles and drones for surveillance in terrorist prone countries for quite some time. Though its use has been largely debated, owing to security issues, it is quite handy when it comes to cost effectiveness and minimizing collateral damage. While drones have been popularly used for tasks high above the ground, robots are speeding traction for battles on ground. As for the US, there were reports of Pentagon announcing a heavy investment in developing prototypes for a combined-arms squad, where the state-of-the art military units will include both human soldiers and robot aiming to maximize the performance on future battlefields. According to a Pentagon press release, Six3 Advanced Systems was awarded the $10 million contract “to design, develop, and validate system prototypes for a combined-arms squad, combining humans and unmanned assets. With the high tech advancements, the idea is to improve capabilities in military and maximize squad performance in increasingly complex operational environments. MAARS: The MAARS (Modular Advanced Armed Robotic System) with it modular design allows the controller to outfit it variety of armaments, ranging from lasers to tear gas. SAFFir: Designed to support functions in the military, this robot developed by Virginia Tech engineering students can extinguish fires that break out on Naval ships and is still under development. Gladiator: It assists the US Marine Corps in various operations and can be outfitted with various modular tools and armaments depending on the situation. It runs at 10 miles per hour and can be mounted with machine guns and grenade launchers. When it comes to seeking AI and robotics for surveillance and military purposes, China is pacing up it activities quite strenuously. It was recently reported that China’s military is funding the development of new AI driven capabilities in battlefield decision making and autonomous weaponry. As China is aiming to become a military technical superpower and catch up with US and Russian armed forces, it had selected 120 top specialists to work in a research institute pushing the development of artificial intelligence for military purposes. Most of them have been reported to have PhDs in AI. Another interesting development where robots are being deployed as a part of military strategy is to assemble different types of explosive weaponry. Apart from speeding up the process, these robots ensure safety and looks into labour supply problems. The bots are also being used to produce more sophisticated weapons such as guided missiles. Use of robotics or smart machines in ammunition factories has resulted in an increase in productivity by 200%. Apart from AI and robotics, Chinese military is looking to move into quantum technology, developing sophisticated equipment and weapons that can do everything from track military aircraft to crack encrypted enemy codes. One such development is futuristic “eye in the sky” warplane that can detect stealth vehicles. Other than US and China, Russia’s military has been using artificial intelligence in cruise missiles and drones. Russia had recently announced its plan to send it gun-wielding Final Experimental Demonstration Object Research (FEDOR) robot to space. It can drive cars, exercise and, supposedly, help bring Russia’s spacecraft Federatsiya into orbit by 2020. Russia has also shown off a Ratnik-3 third-generation infantry combat suit. 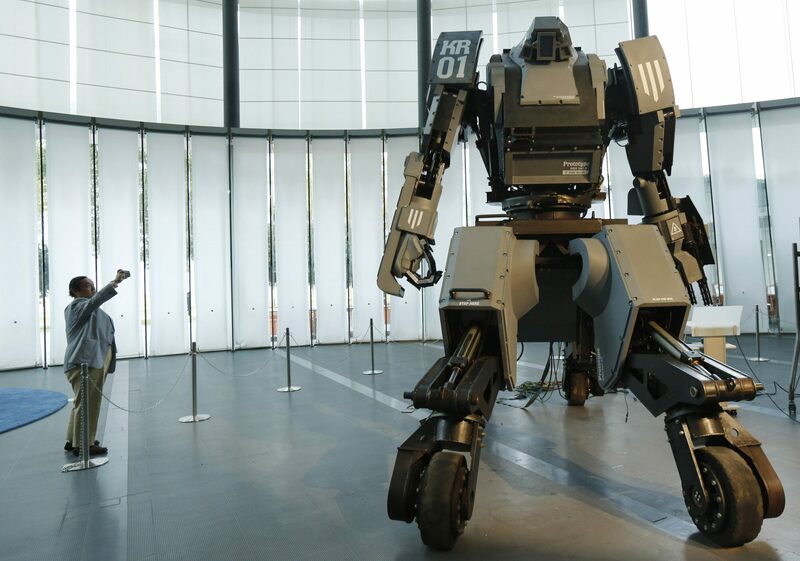 It was reported in August last year that the Indian Army plans to use hundreds of indigenously built robots to fight terrorists in Jammu and Kashmir. These robots can reportedly deliver ammunition at the intended locations in case of unsafe and emergency situations. 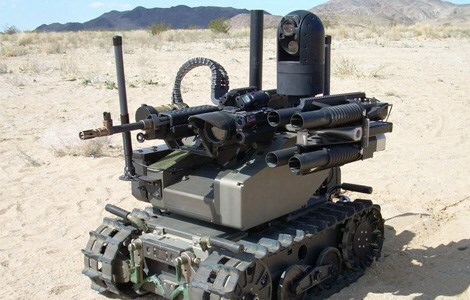 There were few reports that suggested defence ministry has already approved an army proposal to induct 544 robots for the purpose. 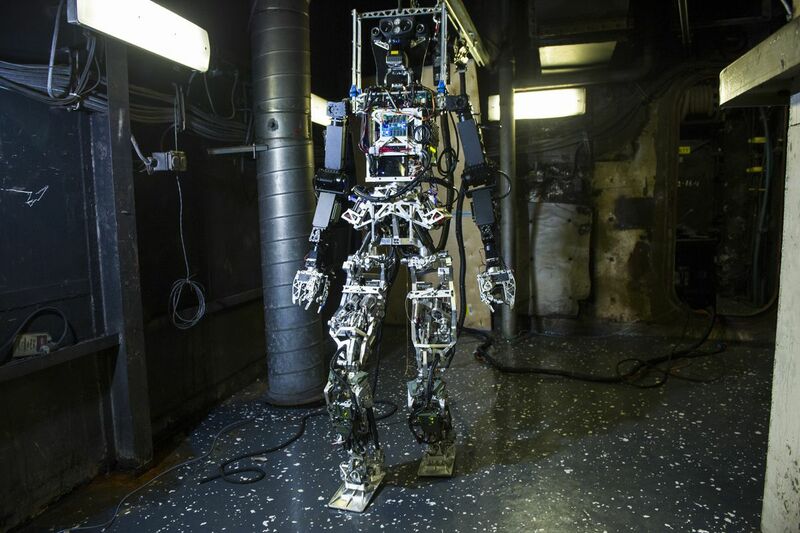 These robots are lightweight and consist of surveillance cameras and transmission systems with a range of 200 metres. 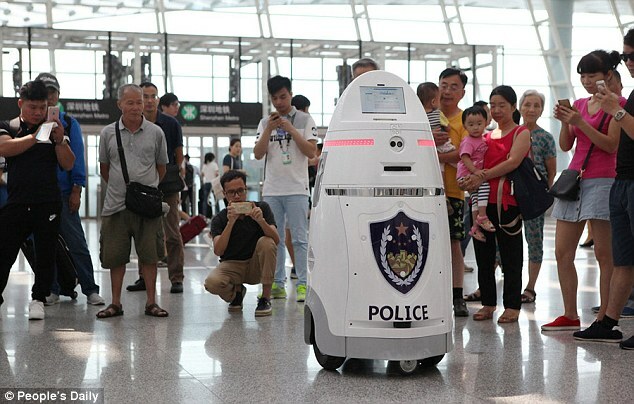 As the instances of terrorism are expanding from jungles and rural areas to urban sectors, there is a need for adopting robotic security in surveillance. 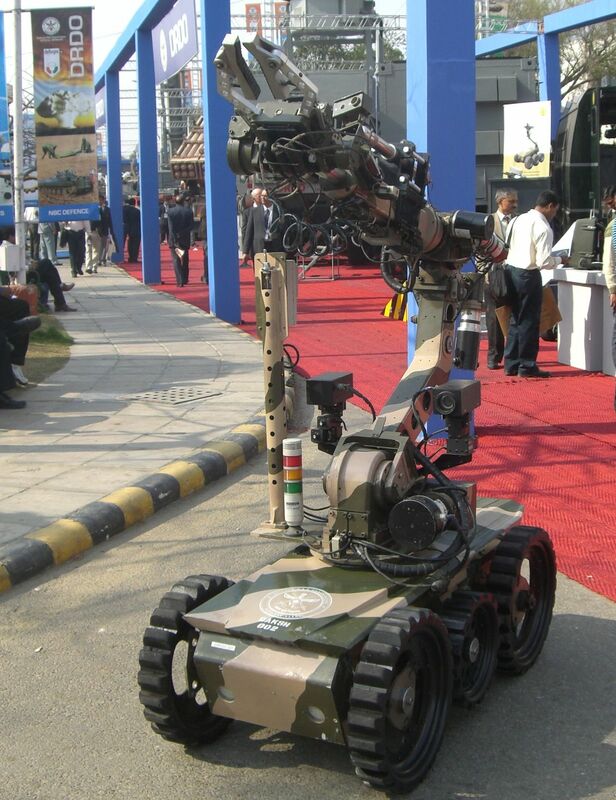 Experts believe that these robotic surveillance platforms can be extensively used by the RR forces (Rashtriya Rifles) for gathering real-time input prior to manual insertion. Army aims that it should be able to deliver suitable ammunition such as stun grenade. The security forces are also using Daksh, developed by DRDO that can climb stairs, lift 20 kg loads and has a three-hour battery life. It can be operated with remote within a range of 500 metres, and is being used largely for handling explosives. 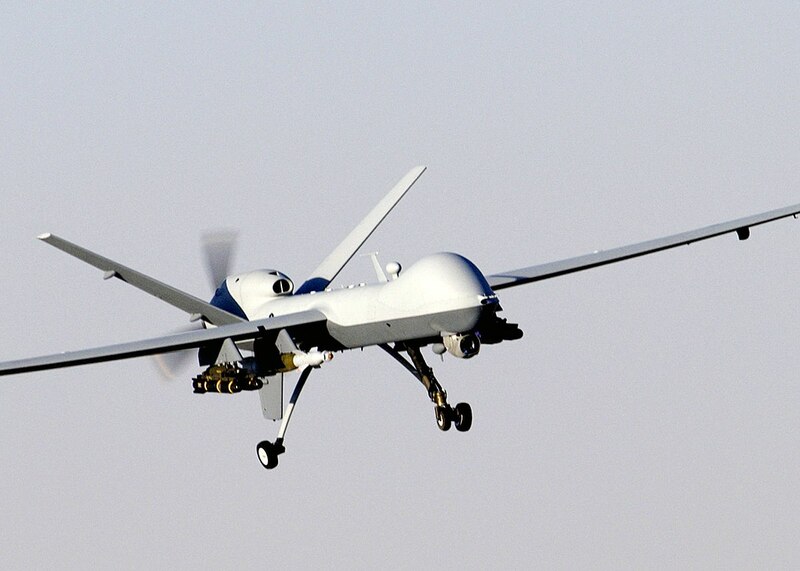 The CAI has also been developing Multi Agent Robotics Framework (MARF)—which could be used in scenarios like the Pathankot Attack—which is capable of carrying applications like surveillance, exploration and mapping, search, and rescue, among others. Robots and technologies like artificial intelligence have been largely looked as villainous technologies that may call the end of human race if given much heed. When it comes to sensitive subjects like military and defence, the topic gets more intense. While robot can be created to be really smart, it lacks experience and emotional aspect, and may not be able to differentiate between a real terrorist and a child who could be at a wrong place at a wrong time. As Ex-Google CEO Eric Schmidt said, he is ‘very concerned’ that Russia and China are leading the race on artificial intelligence, and will use AI to conquer the world, infusing robotics and AI in military may have negative repercussions. Also Read Hadoop vs HPCC - How these big data giants stack up against each other?